Simple, yet elegant and perhaps even fresh from the garden, these maple roasted carrots are a versatile dish. Just as perfect for Sunday brunch, as well as a picnic or a side for a roast dinner, they are sure to please the pickiest of eaters, because, of course, maple syrup is involved. Children naturally love raw carrots, and you are really going to spoil them with these baked ones. For a different flavor sensation you could skip the dried oregano and opt for coriander instead, with a sprinkling of toasted sesame seeds upon serving for extra interest. And if two pounds of carrots sound like much, think again. These baked carrots will go fast from the serving plate and you will have to quickly whip up another batch if you aren’t prepared for peckish guests. 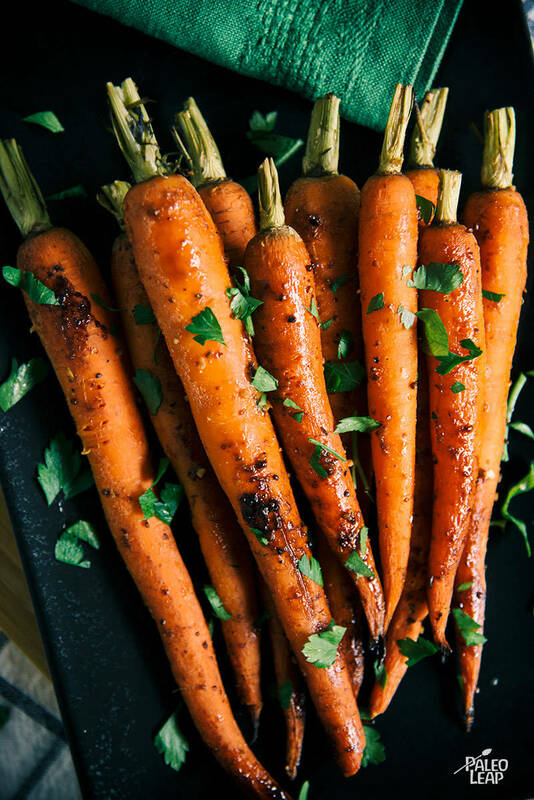 Not only do these carrots look wonderful, their lovely smell will fill up the house with caramelized goodness and there is no stopping the hungry inquisitive onlookers from taking a sample bite. If you are seeking more maple syrup inspiration, you can indulge in flourless banana pancakes, a moderate stack of course, with a smattering of fresh berries on the side. Alternatively you may add it to savory maple-crusted salmon, a dish which is always the highlight of a special evening. If you are in search of an easy to prepare main dish, without added maple syrup, then we know for sure that a pork roast with Dijon glaze will be a match made in heaven. Combine the maple syrup, Dijon mustard, vinegar, coconut aminos, garlic, oregano, salt and pepper in a large bowl. Toss the carrots in the maple syrup mixture until well covered. Place the carrots on a baking sheet, pouring the remaining liquid over the carrots. Place in the oven and bake 25 to 30 minutes, turning at the halfway point. Serve the carrots topped with chopped fresh parsley.